After Christmas, Sonny Boy told me he would like to upgrade his computer desk. His desk was a decade old, L-shaped monstrosity. Still in the Christmas spirit, I agreed that he could use something more current. So to get some ideas, Mrs. Dude, Sonny Boy and I drove to our local Ikea store. After enjoying a nice lunch at their cafeteria, we sauntered down to the computer desks. Sonny Boy was in his glory as he walked back and forth, round and round, closely examining the variety of desks on display. After much pondering, he picked out a model with cool Ikea styling and a large surface area to accommodate his computer equipment. The price tag on the big desk was $200. Not bad, but a little prohibitive coming right after the Christmas buying season! We held off on making the purchase, deciding to paint and spruce up his room first. Once the room was painted, we would run back to Ikea and shell out the $200 for his desk. He was fine with this, so we left Ikea with a game plan. Once we got home however, my garage sale genetics kicked in. I couldn't resist taking a look on Craigslist to see what kind of Ikea furniture was for sale. Typing "Ikea" in the CL search bar, I found the very first listing was for an Ikea computer desk. I clicked on the listing and guess what model it was? Yep, the very one Sonny Boy had picked out at Ikea earlier that day! Not only was it the same desk, but it came with a tall matching shelf and a small cabinet for the printer! The price for everything was $140...Sixty dollars cheaper then the model in the store! I quickly showed the listing to Sonny Boy. Although the color of the table top was different, he still liked it adding, "I am sure you'll get it for less!" Hmmmm......ya think? The next morning I headed right over to the seller's house. Ironically, he had the furniture already outside in front of the garage-a good omen! In the classic young couple's dilemma, the twenty-something seller told me they just had their first baby. Now his wife wanted the big desk and shelf gone to make room for their bundle of joy. I offered the new dad $125 for everything. Since he was under direct orders from the wife to clean house, he gladly accepted. I guess that money should keep them in diapers for a few weeks! I wasted no time getting the desk moved in. With the new year approaching it was, "Out with the old and in with the new." But before taking the old desk apart, I snapped a few pictures of the monster for resale purposes. With the help of Sonny Boy, the new Ikea desk slipped right into the old space and I anchored the tall shelf to the wall just behind it. The resulting desk set looked like a photo out of the Ikea catalog! I was crazy-proud of my purchase. 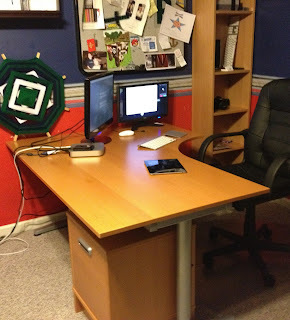 For several days thereafter, I checked in on my son and his desk making inane comments like, "Boy, what a great desk!" and "Isn't that desk sweet?" Sonny Boy got use to my random visits and would quietly shake his head and continue his internet surfing. But I had one more thing to do to complete the deal...sell the old desk. I posted an ad for the monster desk on Craigslist, listing it for $75. Mrs. Dude thought the price was too high. (But hey-who's the one running the big important website here?) It turned out my instincts were spot on...I received an e-mail from a buyer just a few hours later. The interested buyer was a young computer-hipster who showed up in my driveway the next morning and forked over of $75! I helped him load the old monster in his van and it was gone that quick! Step One: Price new Ikea desk in the store for $200. Step Two: Buy same Ikea desk on CL with extras for $125. Step Three: Sell old computer desk for $75. In the end, my total cash outlay for the new Ikea desk with shelf and cabinet came to fifty dollars. That's $150 savings when compared to the store desk alone! t not watch American pickers...or read your blog! Here's to a good year! lOVE IT. Here is to an amazing 2012! Dude, Sonny Boy's new desk is really nice! Do you have any tips on how to sell stuff on Craigslist? Husband got a new phone and sold his iPhone 3 on craigslist for $110. We only paid $90 for it two years ago! I don't know where you live but where I live there would have been 6% sales tax on the IKEA desk as well ($12). So you may have saved even more/paid even less. Great job, you're an inspiration. Kate- Totally forgot about the tax which is at least 6%, even better! Thanks for the props! Hey Maggie-The Iphone flipping is definitely blog worthy, I've done the same thing for my Apple obsessed boys. Thanks and great deal! Thanks Miss Clamco, looks good right? I did a write up on dealing with Craigslist buyers a few months ago. With selling, I basically use the same description as I would on eBay. Also important to keep renewing the listing to keep your ad at the top of the page. May need to expand on the CL selling in a future blog, thanks! Suzy-Back at you & Happy 2012! Great story Dude. I am always coming back for more! Hey Rams- Thanks & great return on your bedroom set. you basically "rented" it for only $100 per year, I'll take that any day!